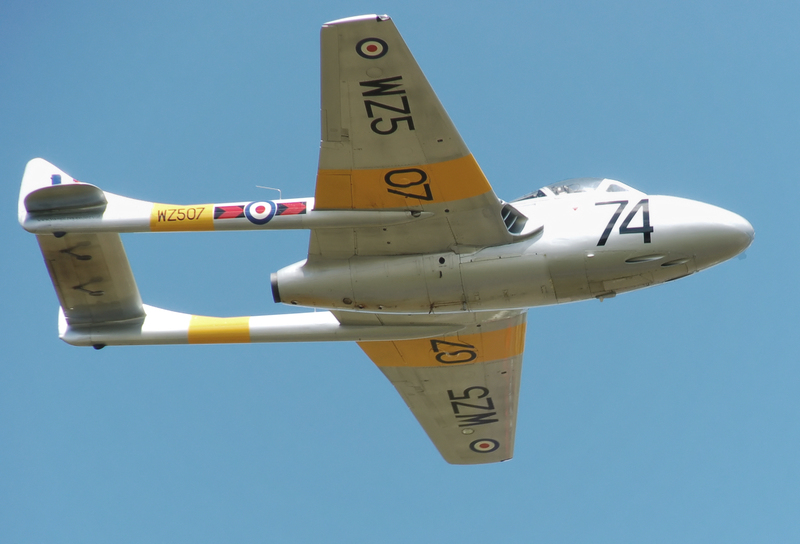 T11 de Havilland Vampire – Photographed by Adrian Pingstone in June 2010 and released to the public domain. On 21st January 1957, residents in Lavendon heard a military aircraft flying low over the village, followed shortly afterwards by a loud explosion and the impact of the plane hitting the ground near Lower Farm at the end of Castle Road. The aircraft was a de Havilland Vampire jet trainer with an American Air Force pilot instructor, Captain Charles Bernard Christison of California, on board together with his pupil, RAF Pilot Officer Thomas Stephen Howdle, both based at RAF Oakington. 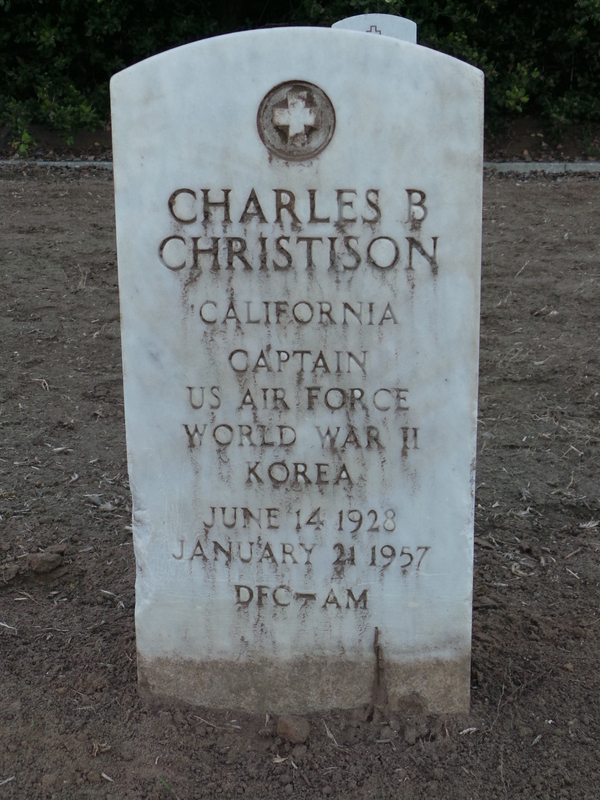 Headstone for Capt Charles B Christison, Fort Rosecrans National Cemetery. Photograph: Neil Stickells. 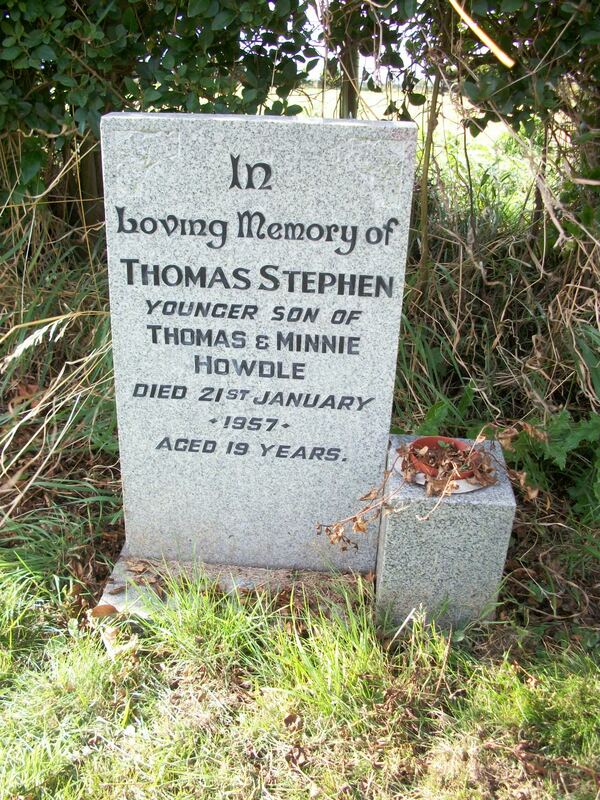 Headstone for Pilot Officer Thomas Stephen Howdle at Rawcliffe Cemetery, East Yorks. Photo courtesy of http://www.findagrave.com. Both the instructor and pupil were killed in the crash and the Ingram family who lived at Lower Farm were lucky to escape with their lives. A number of sheep in the field where the crew were trying to make a forced landing were also killed, and debris was scattered over a wide area. Captain Christison came from California. Despite his relatively young age of 28 years, he had previously served in WW2 and was a veteran of the Korean War. At the time of the crash he was on an exchange visit to the UK accompanied by his wife, Wanda, and two children. Sadly, they were to return with his body back to California shortly after the crash. Captain Christison was later buried at the Fort Rosecrans national cemetery at Point Loma, San Diego. 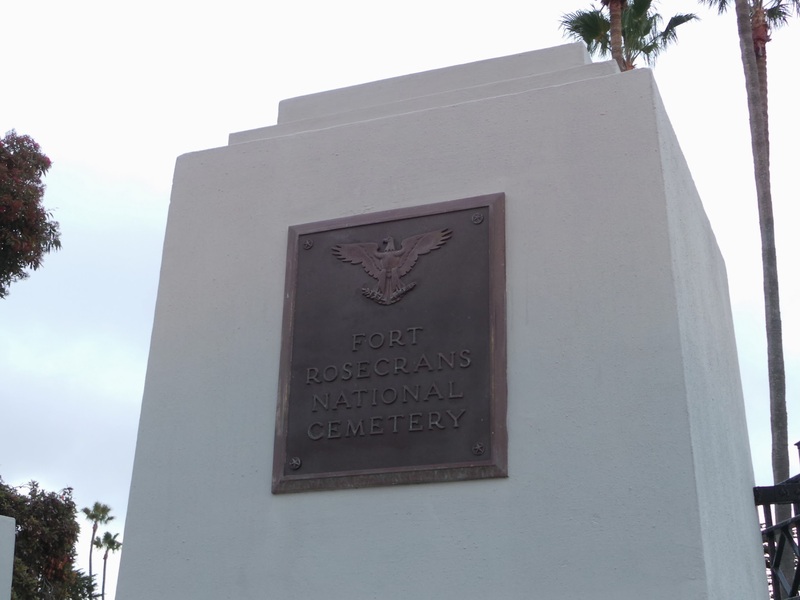 Fort Rosecrans National Cemetery. Photograph: Neil Stickells. Pilot Officer Thomas Howdle was 19 years of age when he died. He was the younger son of Thomas and Minnie Howdle and brother to Peter. Thomas was buried in his family’s home village of Rawcliffe in the East Riding of Yorkshire, located on the banks of the River Aire. An American Air Force pilot, with a British trainee by his side, circled the village of Lavendon on Monday afternoon in a Vampire jet trainer. He knew he was in trouble and tried to land in an open field. He succeeded in missing the houses but the plane exploded killing him and his pupil pilot instantly, and scattering wreckage over more than 1,000 yards. The pilot was Capt. Charles Bernard Christison (28), of California, in Britain on an exchange posting and was on an instrument exercise with Pilot Officer Thomas Stephen Howdle (19) from No. 5 Flying Training School at R.A.F. Oakington, near Cambridge. Many people heard the jet come screaming over the village, but only a few of them realised the pilot was in difficulties. Mr. Ray Ingram, of Lower Farm, Lavendon, and his brother John, were perhaps the only eye-witnesses of the crash. They were on their way back to the farm after visiting some of their fields, but paused to inspect another field. That action probably saved their lives, for if they had carried on they might have found themselves in the wreckage strewn area of the Twelve Acre field at the time of the explosion. Mr. Ingram said he and his brother heard a scream and saw a black flash just before the loud explosion. “I didn’t realise it was a plane until later” he said. They hurried to the scene and after finding there were no survivors, John ran to telephone the Police. The plane was believed to have struck a willow tree on its “run in” for a crash landing. A flock of sheep was grazing nearby. Luckily only three of them were killed, but the severe fright the other ewes received may have severe consequences when they are due to lamb in a short time. Mrs Iris Ingram was in the kitchen of Lower Farm house when she heard the jet roar overhead about 2.40 p.m. Many aircraft fly over Lavendon in the course of the day, usually from the same direction, but she quickly sensed something was wrong. Council houses over a mile away were shaken by the explosion and many other buildings in the village felt the force of the blast. Fire engines from Olney and Northampton rushed to the scene, quickly followed by ambulances from two counties. There was nothing either firemen or ambulance men could do. Several of the vehicles became bogged down in the mud and had to have assistance from police and farmworkers to get free. The same mud helped the Police keep the scores of onlookers away from the crash. Numbers of high-ranking officers from both the R.A.F. and the American Air Force visited the scene the following day and inspected the wreckage. On Tuesday afternoon an inquest on Pilot Officer Howdle was opened at Newport Pagnell Police Station and adjourned after evidence of identification had been given by a Flying Instructor at R.A.F. Oakington, Flt. Lt. Roger Chick. Flt. Lt. Chick told the Coroner for North Bucks, Mr. E. T. Ray, that Howdle was a member of his flight. He knew he had been authorised to fly with his instructor, Capt. C. B. Christison in that particular aircraft for an instrument exercise. The date of the adjourned hearing was later fixed for February 1st. An inquiry into the death of Capt. Christison will probably be held by the U.S.A.A.F. at Alconbury, Huntingdonshire. His body was flown home to America on Wednesday, accompanied by his wife and two children. 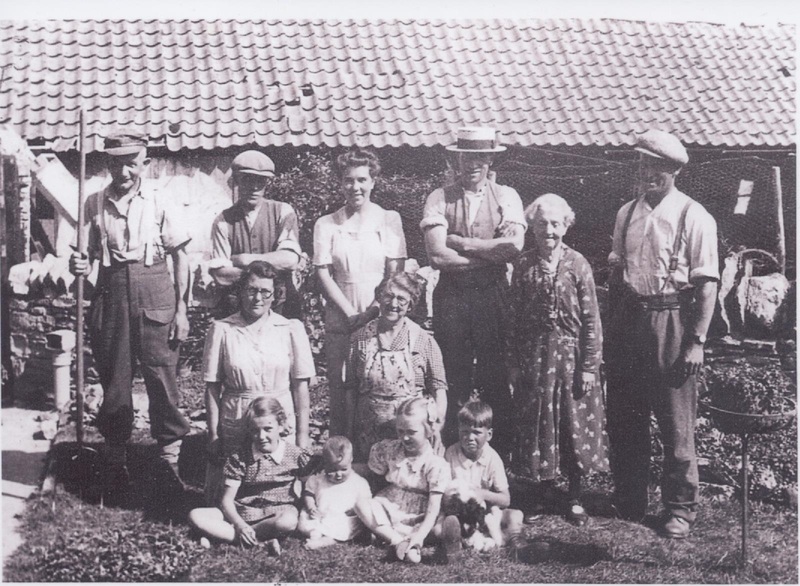 The Ingram Family, formerly of Lower Farm. Iris is standing in the middle at the rear, together with John and Ray Ingram respectively standing on the right. Both during and after the day of the Vampire crash, village residents gave the RAF rescue and recovery party a good deal of practical assistance, and provided local accommodation. The RAF Crash Party were kind enough to provide a token of their appreciation in the form of an official shield, as seen here. Although the shield records the assistance given in December 1956, in practice the accident occurred in January 1957.